Amazing things turn up on the beach. Puzzling things. 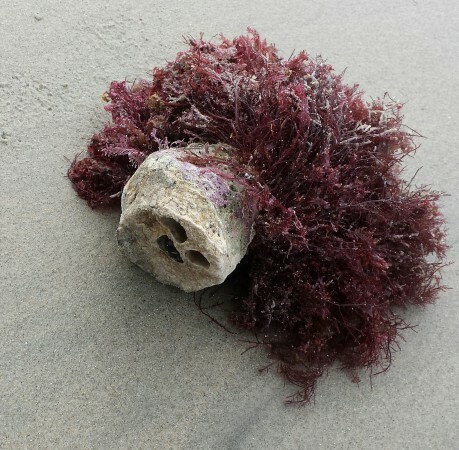 This algae is attached to this rock. I don’t know what it is, either of them. The rock itself beckons, with its face-suggesting indentations. I love the purple hair. Maybe I should get a wig like that. Someday soon?! We walked down to the beach with our neighbors and their friends. They were going surfing. I don’t think I’ll surf. It seems like a lot of standing and waiting and just a little of riding the wave. Snow skiing has a better ratio of doing to waiting. And surfing in the winter seems a bit too chilly! The friend is a coastal geologist and he confirmed that the pods on the kelp are air bladders, and keep the kelp upright. They do pop with a satisfying crack when you step on them, but somehow I feel guilty stepping on them. It’s a little like crunching leaves in autumn. Is the kelp on the beach still alive? Is it stranded and desperate? It certainly seems bedraggled, abandoned, sad. We walked mid-afternoon and it was very cloudy and yet it never really feels gloomy. Maybe I just can’t feel gloomy at the beach. No gloom at the beach, no gloom. “Gloomy” sounds gloomy, yes?